Miami—The ISKCON Food for Life program is in full swing here and in other cities across the United States and abroad. Making use of surplus food from the U.S. Department of Agriculture as well as other donated food, devotees cook simple dishes, offer them to Lord Krsna, and then take the delicious prasadam out to parks and other public places for free distribution. In Philadelphia, Visnor-aradhanam dasa and Candrika-devi dasi head up the program. Says Candrika, “We’ve had an overwhelmingly favorable response from both the government and the people. The government has provided huge quantities of free surplus foodstuffs, and the people we serve are so enthusiastic about prasadam that we’re distributing every day of the week. In Paris, Hari-vilasa dasa runs a program that features not only free prasadam but also the chanting of Hare Krsna, diorama displays, and Krsna conscious literature in six languages. Attracted by the sound of the chanting, crowds of people in the Centre Pompidou—a cultural center drawing eight million visitors a year—gather within minutes to see the displays and receive free copies of Srila Prabhupada’s books in French, English, Arabic, Spanish, Hungarian, and Armenian. Hari-vilasa, president of France’s Spiritual Sky Scented Products, helped finance the printing of these books and personally distributes them. 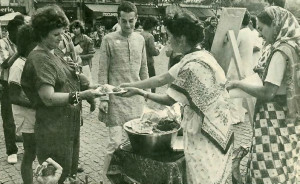 Meanwhile his wife, Parijata-devi dasi, distributes prasadam to hundreds of hungry Parisians and tourists. 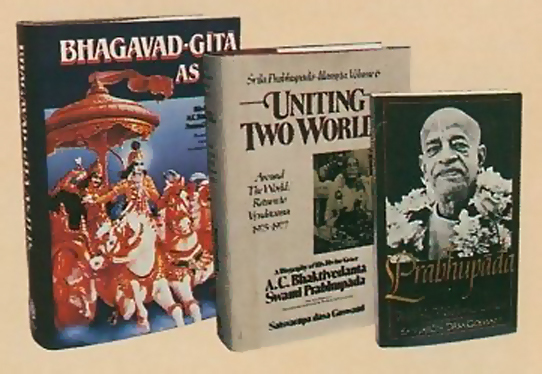 Los Angeles—The Bhaktivedanta Book Trust (BBT) recently published a second edition of Srila Prabhupada’s Bhagavad-gita As It Is (250,000 copies). Since 1972, when the Macmillan Company published the first unabridged edition, the book has been printed in over forty languages. Srila Prabhupada was pleased with the first edition, even though the inexperience of the new American disciples who assisted him in preparing the manuscript was evident. In the second edition the word-for-word Sanskrit-English equivalents are clearer and more precise. And in places the translations, though already correct, have been revised to come closer to the original Sanskrit and to Srila Prabhupada’s original dictation. Another new book is the condensation of the Srila Prabhupada-lilamrta, entitled Prabhupada (300,000) copies. 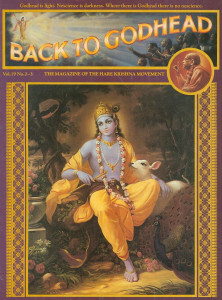 The BBT will soon print translations of Prabhupada in Italian, Spanish, German, and Chinese. 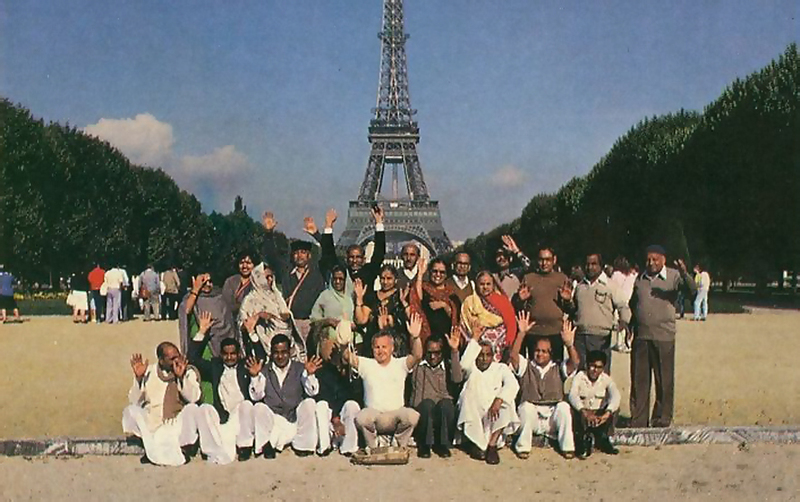 Gunarnava dasa (seated at center) and members of the Vrndavana Cooperative Trust’s first cultural exchange tour in Paris last fall. Similar tours are scheduled to begin in April this year. 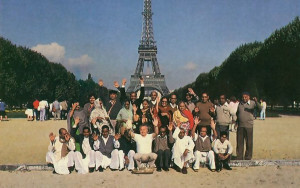 With the assistance of travel agents in New Delhi and ISKCON devotees throughout Europe, Gunarnava carefully planned a three-week tour through Italy, Switzerland, Great Britain, the Netherlands, and France, including overnight accommodations at four- and five-star hotels and multi-course midday meals at ISKCON centers in each country. The cuisine was an important part of the tour, since, as devout followers of India’s ancient Vedic culture, most of ISKCON’s life members are lifelong vegetarians. The tour members met Gunarnava in Delhi and flew to Rome. Arriving at four in the morning, they were greeted at the airport by ISKCON devotees, who garlanded them with flowers. 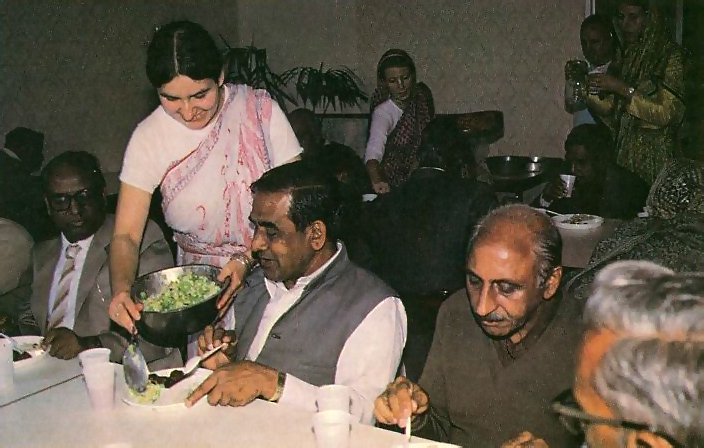 Later that day, after touring Rome, the life members rode in an air-conditioned bus to the ISKCON center on the outskirts of the city for a sumptuous feast of krsna-prasadam (food offered to Krsna). For ISKCON’s purely vegetarian Life members, delicious krsna-prasadam, cooked and served by devotees, highlighted the tour. Here members relish prasadam at the ISKCON center in Amsterdam. The tour continued in this way—visiting ISKCON centers as well as many traditional European landmarks. In fact, some of the ISKCON centers are themselves European landmarks. Villa Vrndavana, near Florence, is a renaissance palace once owned by political theorist Niccolo Machiavelli, and has now been transformed into a spiritual center for painting, sculpture, and the Vedic arts. And the Chateau d’Ermenonville, near Paris, was once the castle of French kings and the home of philosopher Jean Jacques Rousseau. It is now being restored by ISKCON devotees to serve as a museum of Vedic history. “The members were very inspired,” said Gunarnava. “They couldn’t believe that ISKCON was so well-situated in Europe. They were wonder-struck at how the devotees were preaching very vigorously and spreading Vedic culture. “Prabhupada very much wanted this cultural exchange program: those in India visiting our centers in America and Europe, and those in the West visiting our centers in India. Prabhupada wanted East and West to combine under the one flag of ISKCON. Upon returning to India, Gunarnava received enthusiatic letters of appreciation from all the members of this first tour. This year, beginning in April, he plans to lead similar tours, and he foresees taking ISKCON life members throughout both Europe and America.